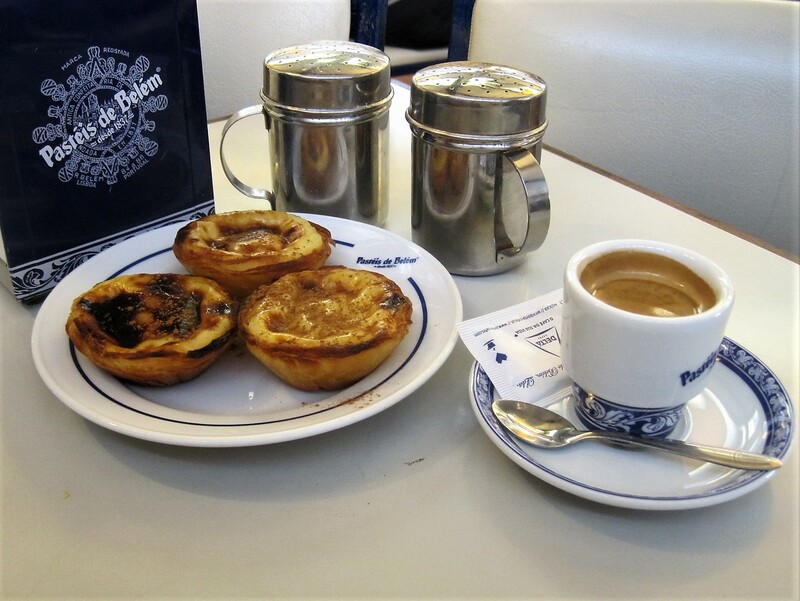 There were two main reasons for my visit to Lisbon last October. I’ve already shared with you the first- the Jerónimos Monastery. 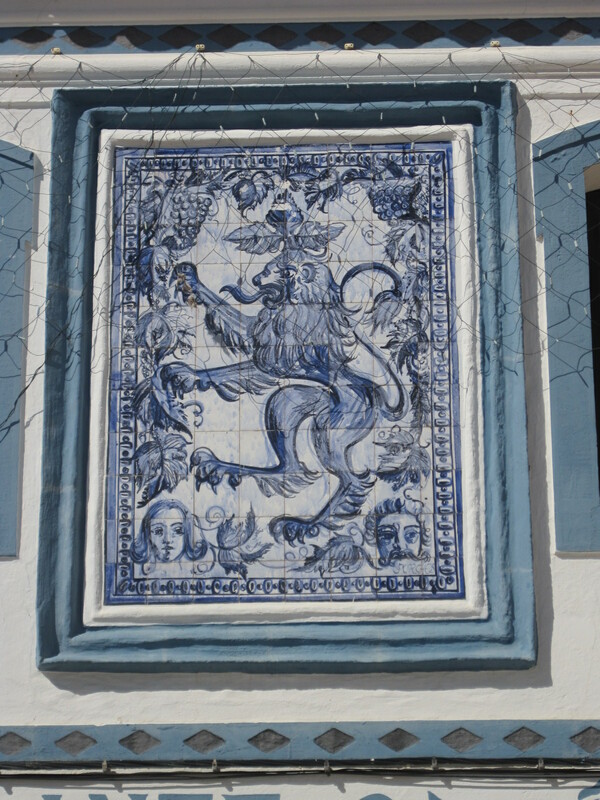 This is the second- the Museu Nacional do Azulejo. It’s not normally recommended to walk there, but it’s not a great distance, and there’s a very nice restaurant when you arrive. So, why not? 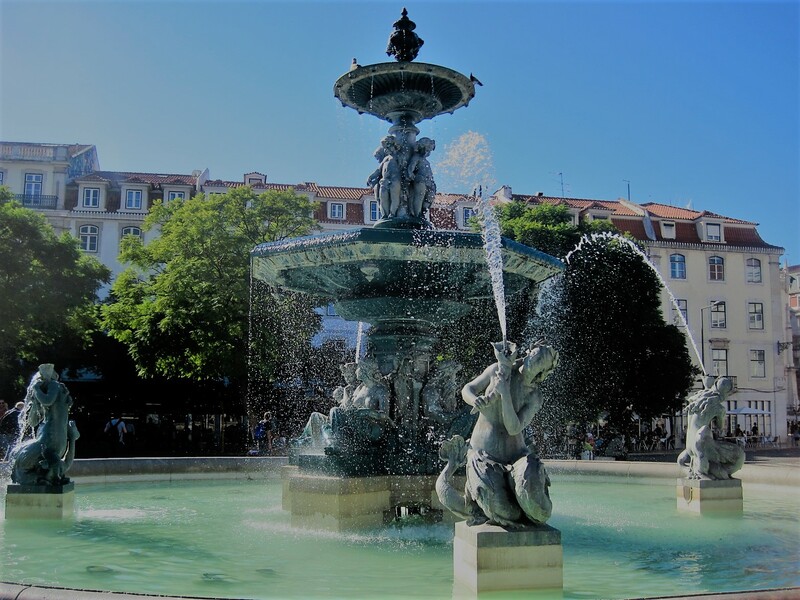 My start point was Praça do Comércio, always an interesting space, where Lisbon fronts the water. Some people can sleep anywhere, can’t they? I even found a tiny strip of beach, but let’s not get distracted. The road threads along the riverfront, beneath Alfama. Roadworks were a bit of a nuisance, as was a chap on a bench, who misdirected us for the price of a euro. That’s cities for you! I had it in my head that along the way I might stop off at São Vicente de Fora, for the cloisters, a coffee, and a view. Don’t try it on foot! A tuk-tuk ride would be a much better idea. Google Maps showed that it was only 1.2 miles from the Praça to the museum, but I found myself hugging shade as it was remarkably warm for late October. Interesting rather than scenic is how I would describe the route, as we passed the cruise terminal and then Santa Apolónia railroad station. At a bridge spanning railway and docks, a tourist bus sped past. And then, amazingly, there it was! What a wonderful use for an old monastery. Tile lovers, you are in for a treat! 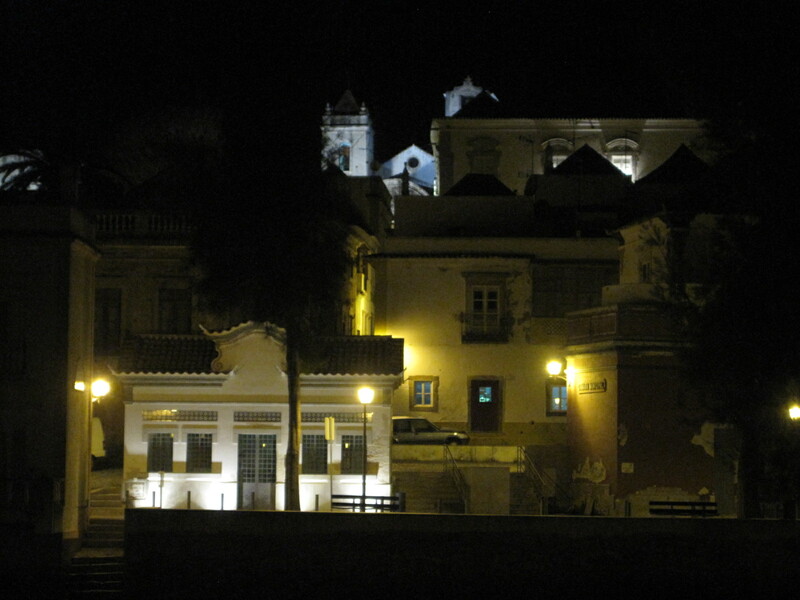 The convent of Madre de Deus was founded in 1509 by Queen Leonor. 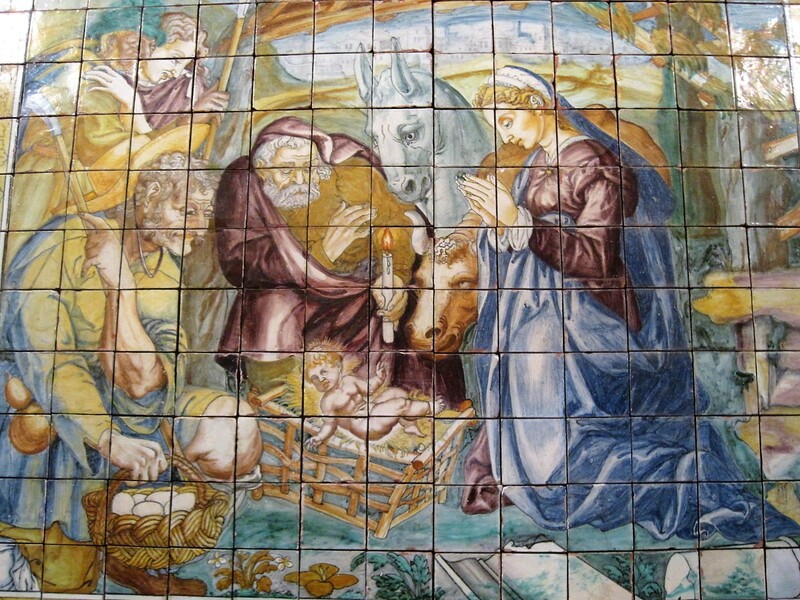 Over time, many azulejo panels were stored there, and in 1957 it was decided to have an exhibition commemorating 500 years after Leonor’s birth. 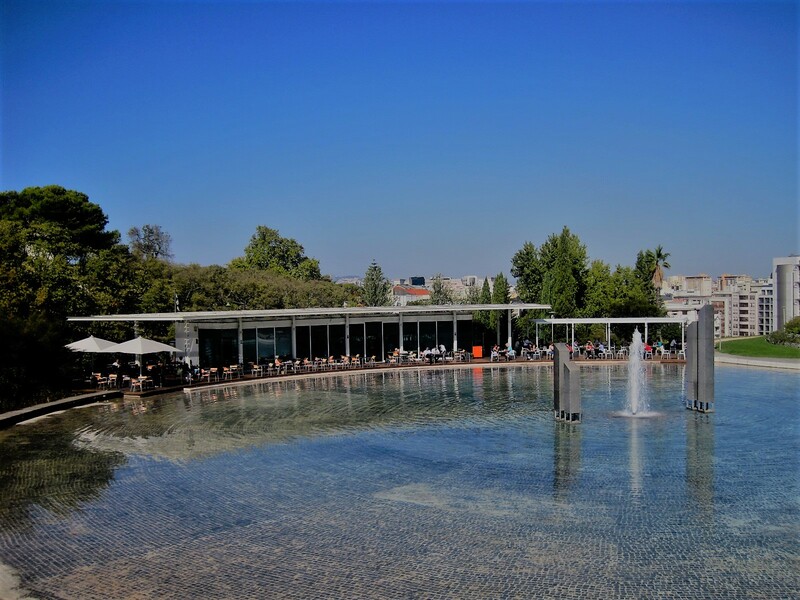 The Calouste Gulbenkian Foundation undertook the restoration work needed. 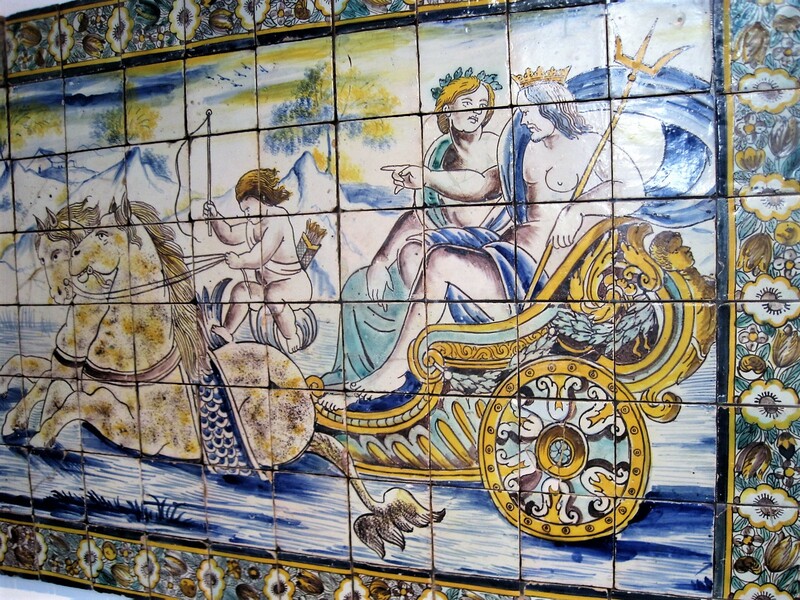 When the exhibition ended, in Jauary 1958, a wealth of tiles were available and it was proposed to transfer the Ceramic Section of Lisbon’s Museu Nacional de Arte Antiga to the building. It was finally opened to the public as a museum in the 1970s. First things first! It was into the restaurant for some recovery time with delicious salads, in a prettily tiled setting, or a leafy outdoor courtyard if you preferred. Fully fortified, it was time to tackle three floors of azulejos. The museum surrounds the courtyard and cloisters, and has an incredible collection of azulejos, dating from 16th century to present day. The magnificently restored church is incorporated into the museum. You will be advised not to miss it and I could easily see why. The decor includes rich, gilded woodwork, fine paintings and, of course, azulejo panels. Time to climb to the next level. There are interesting distractions along the way, but if you really can’t manage it then there’s a lift. 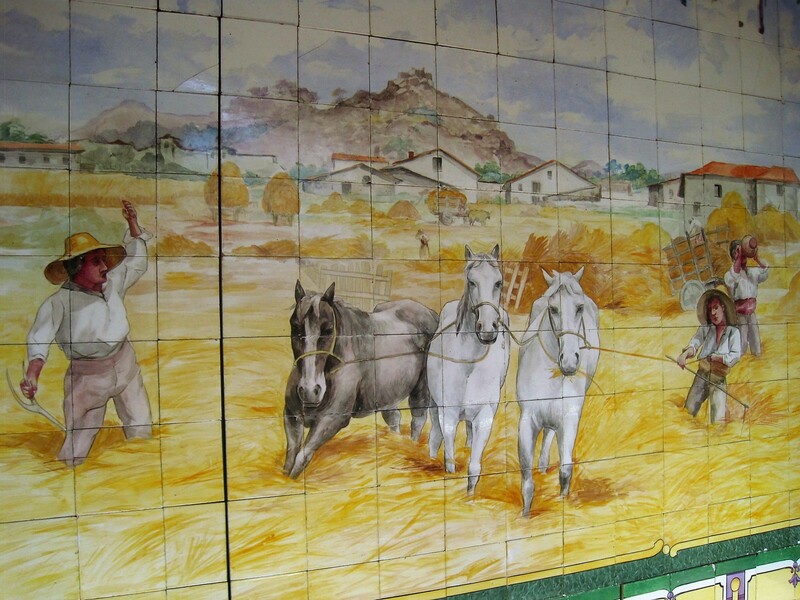 The azulejos change style and era on the next floor. I tried to keep track of the accompanying details but it was too difficult. Much easier to simply admire. The museum website has an App to help you identify the pieces. 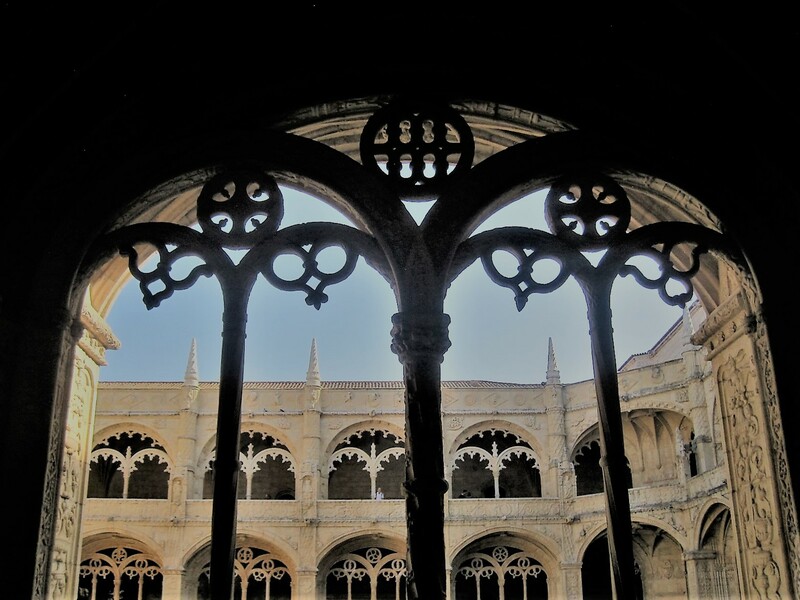 One of the most thrilling aspects of my visit to the Jerónimos Monastery was the moment when I stepped through a doorway to find myself looking down into the body of the church. The same thing happens with Madre de Deus on the second level of the museum. I love the feeling of omniscience. A seat in the Gods. There is just one more level. 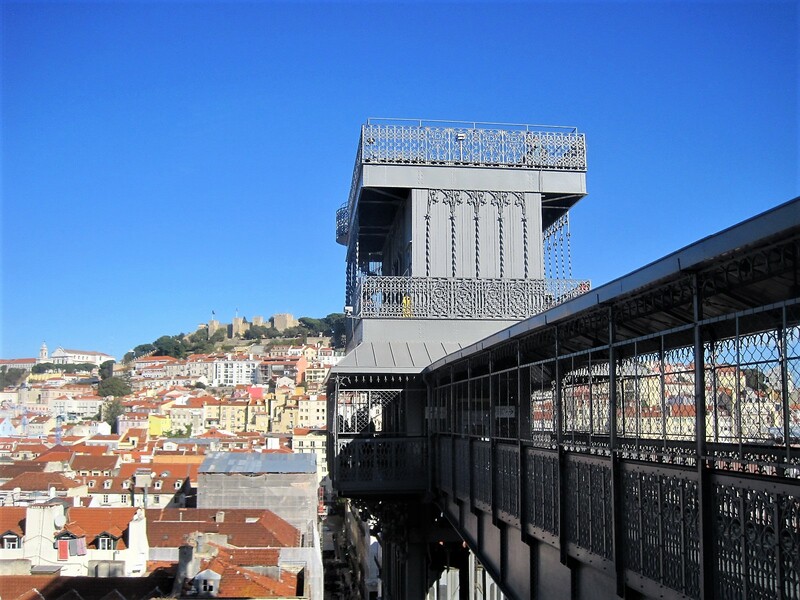 The exhibition culminates, at the top of the building, with an amazing 40 metre panorama of Lisbon, dating from 1730. I have to admit, my eyes were starting to glaze over by the time I’d looked my fill. The good news is that you don’t have to walk all the way back to the centre. There’s a bus stop directly outside the museum and in 10 minutes you can be whizzed back to Rossio, and a different world. Powder white, fresh snow makes for the most beautiful scenery. Thanks, Drake! You could get the impression that Jackie doesn’t do anything but eat! An old friend takes us on a hike, California style. Thanks, Kongo! Whatever the week has in store, I hope you enjoy it. I’m off out with my English walking group today. See you soon! 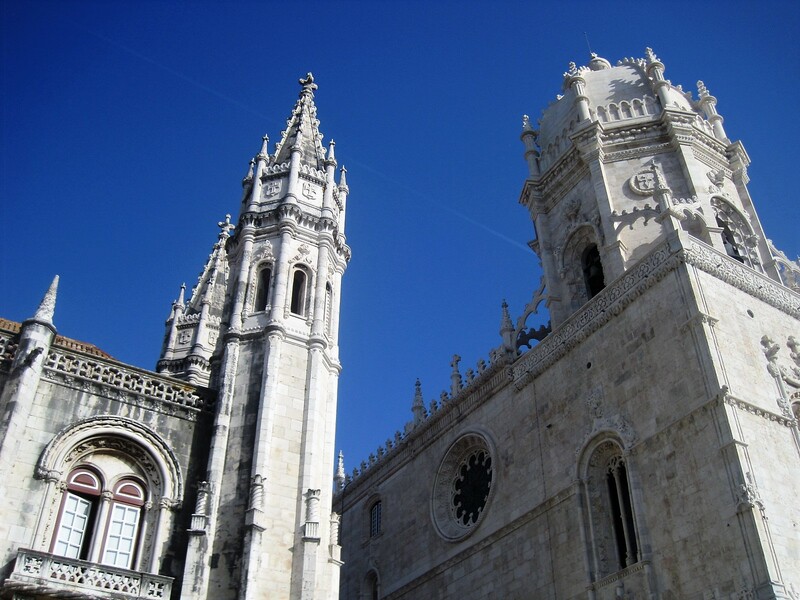 If you came on my Monday walk to Belém, in Lisbon, you will have guessed that this is the Monastery of Jerónimos. Not hard to see why it is a UNESCO World Heritage site, but I hope you will join with me in celebrating its beauty. My expectations were high, for this was the third time I’d come to Lisbon, hoping to visit the monastery. They say God works in mysterious ways, and it’s not for us to understand. I was happy simply to stand in the midst of all this glory. 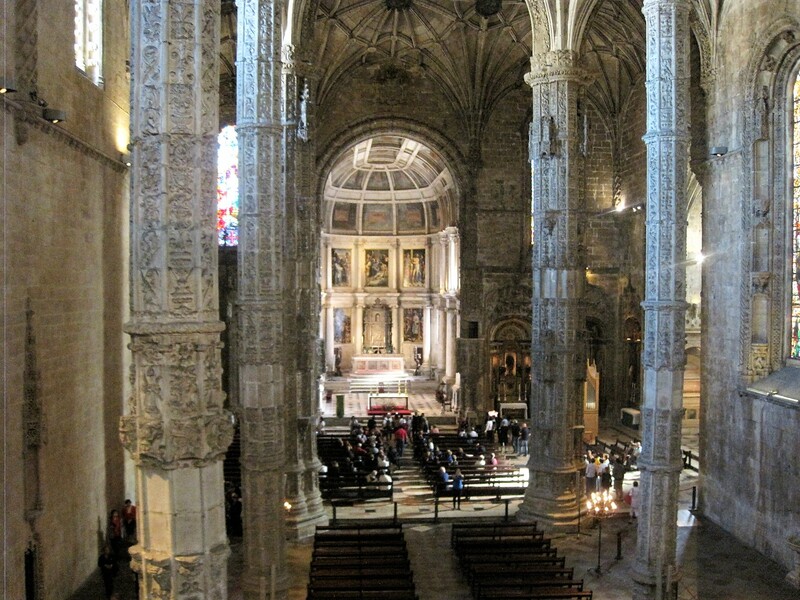 A church dedicated to Santa Maria de Belém was the forerunner to the monastery. 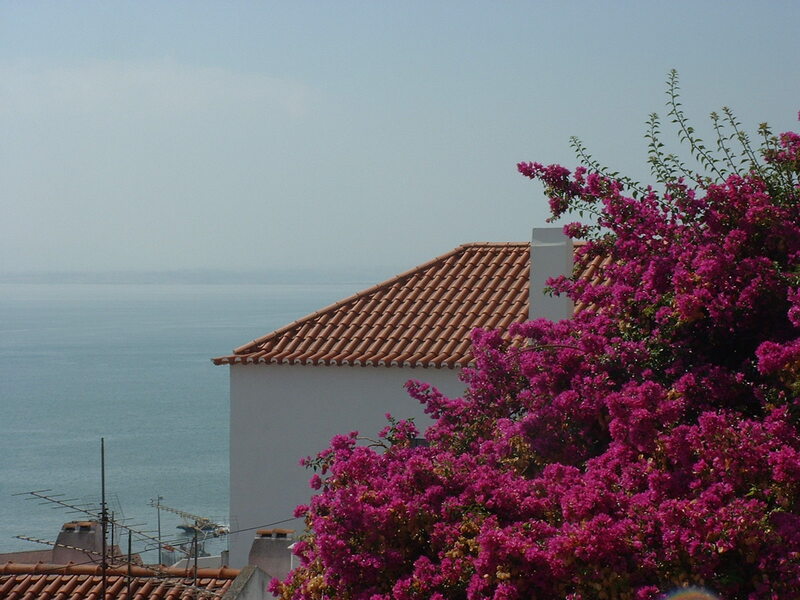 This stretch of the River Tagus provided a safe harbour and anchorage for shipping back in the 15th century, and the monks of the Order of Christ gave assistance and spiritual guidance to seafarers. 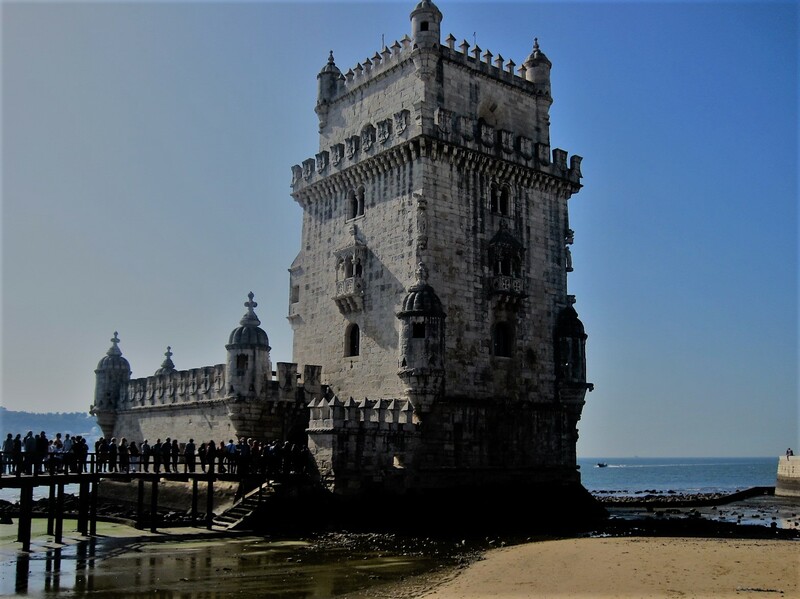 The church was already in a state of disrepair when Vasco da Gama and his men spent the night before their voyage of discovery in 1497, praying. 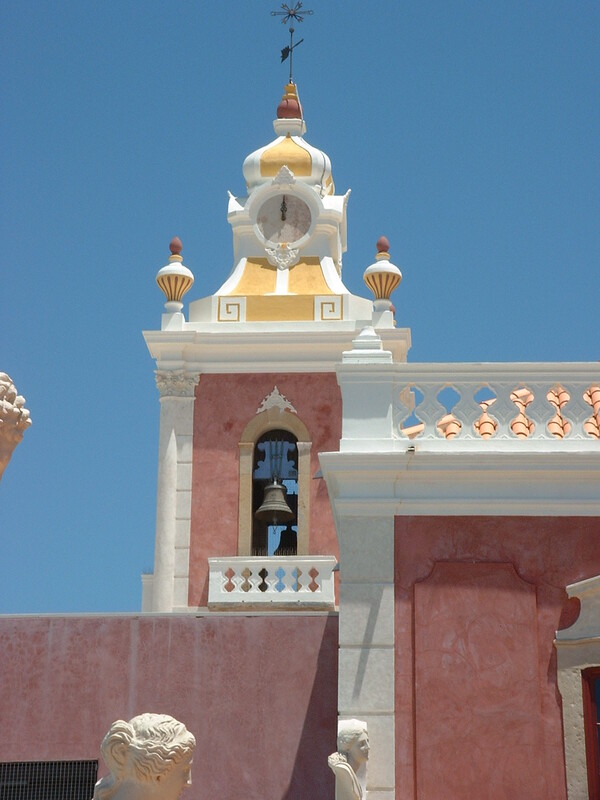 King Manuel 1 sought a dispensation from the Vatican to construct a monastery on the site, and building began in 1501. Completion was to take 100 years. 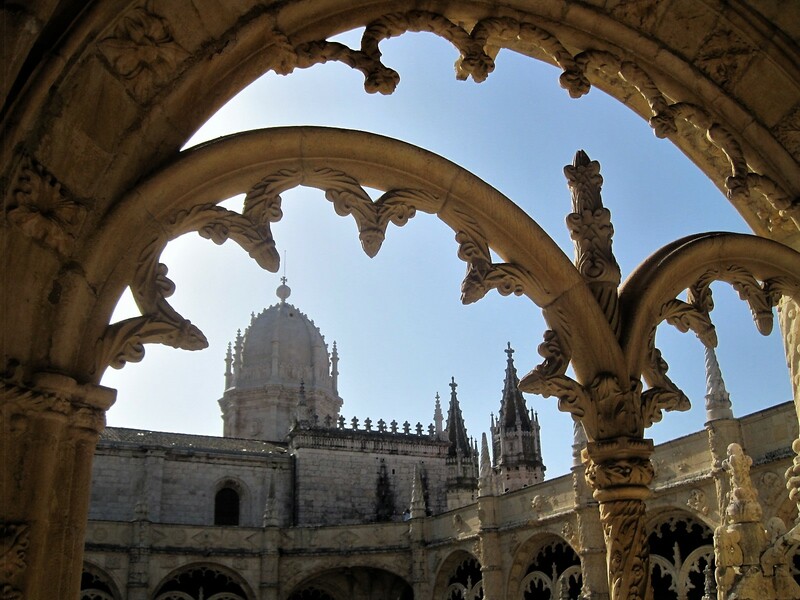 The elaborate style of architecture, involving knots, anchors and all things maritime, came to be known as Manueline, the work originally being funded by the spice trade. Manuel chose the Order of St. Jerome, known as Hieronymites, to occupy the monastery, tasking them with praying for his eternal soul. It was to be a final resting place for him and his successors. The religious order was not dissolved until 1833. The first room that you enter is the monk’s dining hall. Fortunately I can simply share a few azulejos, as Becky presents you with all the details in 500 years old this year. You will be wowed! 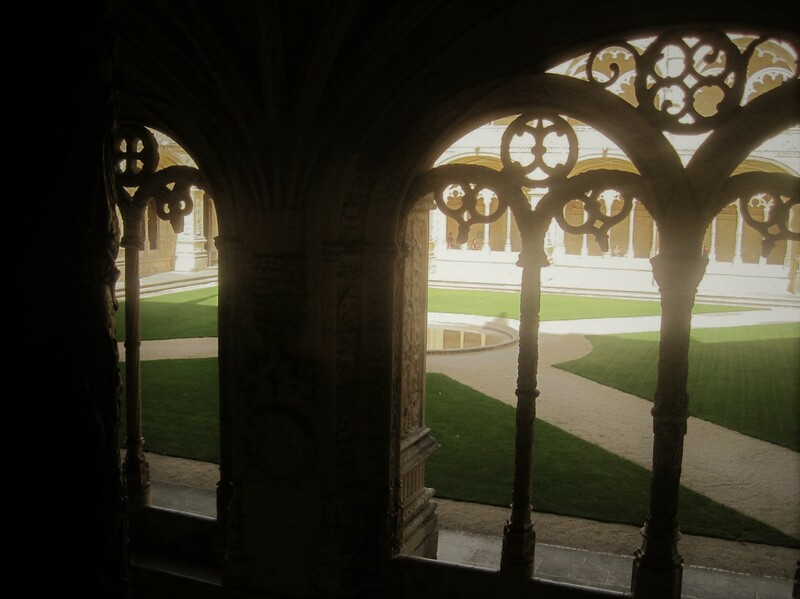 I walk through the cloisters agape. There is nowhere I can look that doesn’t delight me. When I’ve almost looked my fill, I mount the stairs to look down on the courtyard. An incredible moment arises at the top of the stairs. You step into a chamber arching high above you. As you perceive the body of Christ on the cross and the stained glass Madonna, you notice people gathered at a stone balustrade. Stepping forward your eyes light up! You are looking down into the body of the church. Back into daylight, the gargoyles and faces, intricate knots and flowers combine to seduce. Until finally my mission is accomplished and, with sensory overload, it’s time to leave. The monastery was secularised and handed over to a charitable institution in 1833. The many twists and turns since then can be read on the monastery website. It’s that time of year and the Weekly Photo Challenge suggests that you might want to share your 2017 Favorites. For me the last post that I wrote is invariably my favourite, but I do have one particular image that sings out to me from this post. I wonder if you can guess which it is? It simply remains to wish you all a blessed Christmas, and good health and happiness in the New Year. 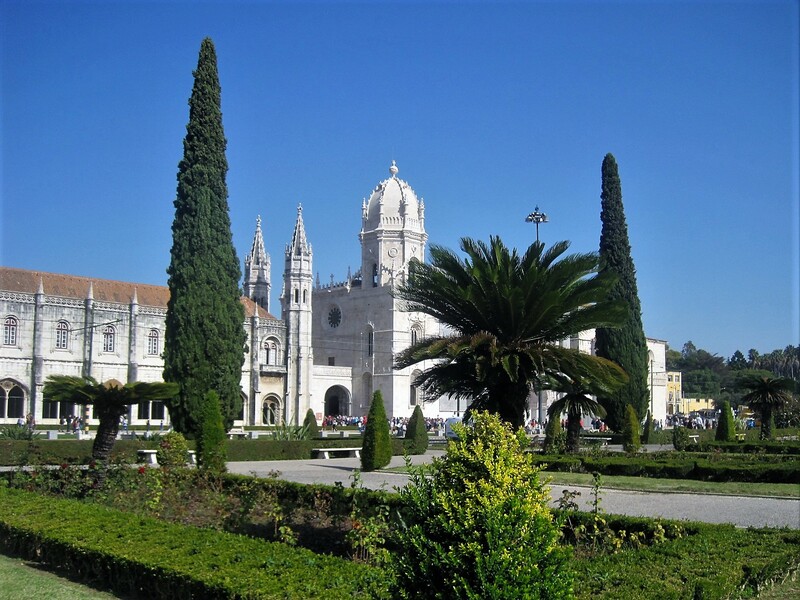 Did you know that the name Belém derives from the Portuguese for Bethlehem? And that makes it a very suitable subject for this time of year, doesn’t it? Just 6km from the centre of Lisbon, it’s a distance I’d normally regard as walkable but, eager to get there, I squeezed myself onto a reluctant bus. No tram for me! My last visit to Lisbon ended in tears when my purse was pickpocketed whilst waiting for the famous no. 15 tram. This time I was determined to make it to the Jerónimos Monastery. And when I did, the disappointment of that failed visit was completely swept away. I’ll bring you back to the incredible beauty of the monastery later this week, but for now I think we should do some walking. Much too soon to loiter over a pastel de nata! We need to get going to stay ahead of the tour buses. I promise you can have one or two later. It is the festive season, after all! Not sure what to make of this street art. Genius or madness? Rua de Belém, the main street, is a strip of historical buildings dating back to the earthquake of 1755. This and Ajuda were the areas least affected by the devastation, and many of the survivors who lost their homes were temporarily installed here in tents and shacks. 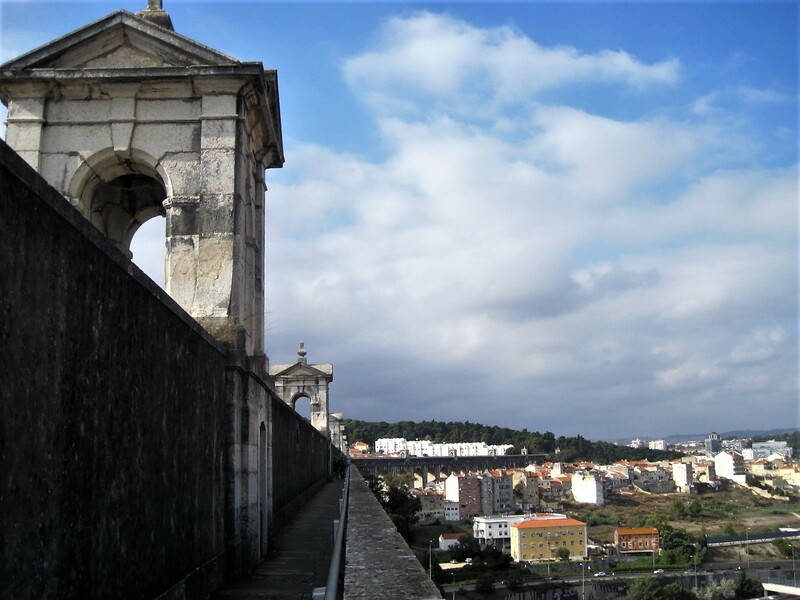 The King and his ministers set up court nearby and, with the construction of Ajuda National Palace, brought trade to the area. With the French invasion of 1807 the royal family fled to Rio de Janeiro, and Belém gradually evolved into an industrial zone. Tanneries, textiles, glass makers and metal stampers were among the factories established. 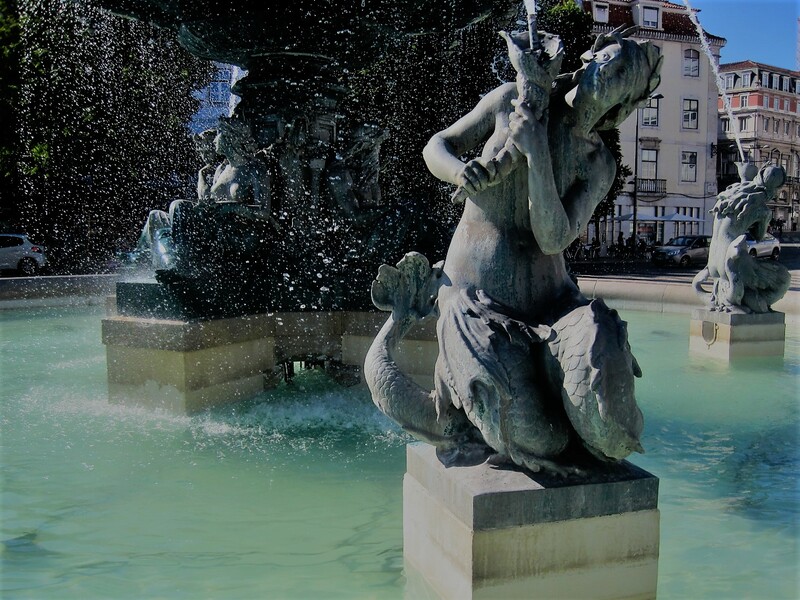 At the heart of Belém lies the Praça do Império, with gardens and fountain laid out during World War II, and beyond it a magnificent sweep of waterfront, culminating in the iconic Torre de Belém. As you can see, it’s a popular spot. The tower was built in 16th century. Delicate as it looks, it was intended as part of the defence system at the mouth of the Rio Tejo, together with fortresses at Cascais– which we saw last week- and Caparica, south of the river. A UNESCO World Heritage site, as is the monastery, it has a colourful history. The two photos below are from a previous visit to Belém in 2005. 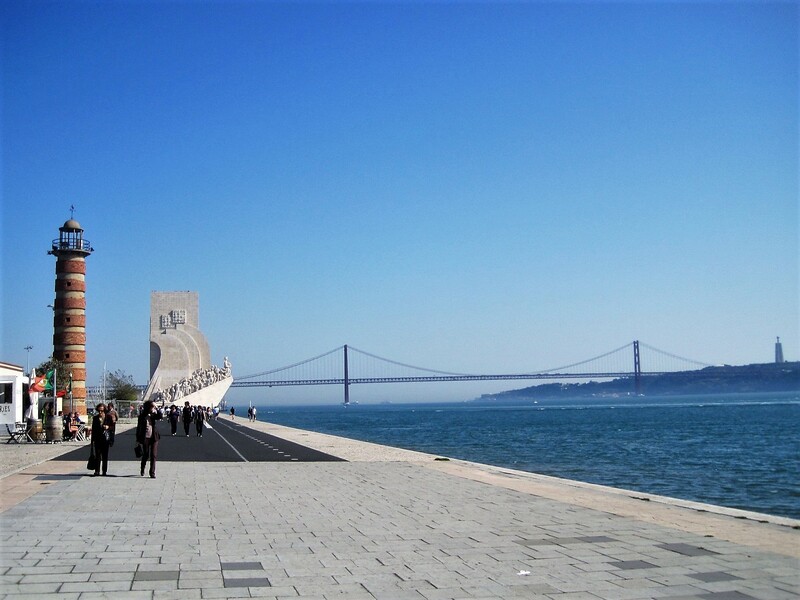 From here you can easily stroll along the riverfront as far as Ponte 25 de Abril, with any number of diversions en route. You might think that not a lot of walking goes on. It’s definitely an area devoted to fun in the sun, but looking ahead I’m excited! The last time I was here I did not know that you could climb these structures. Not only the lighthouse, but Padrão dos Descobrimentos. 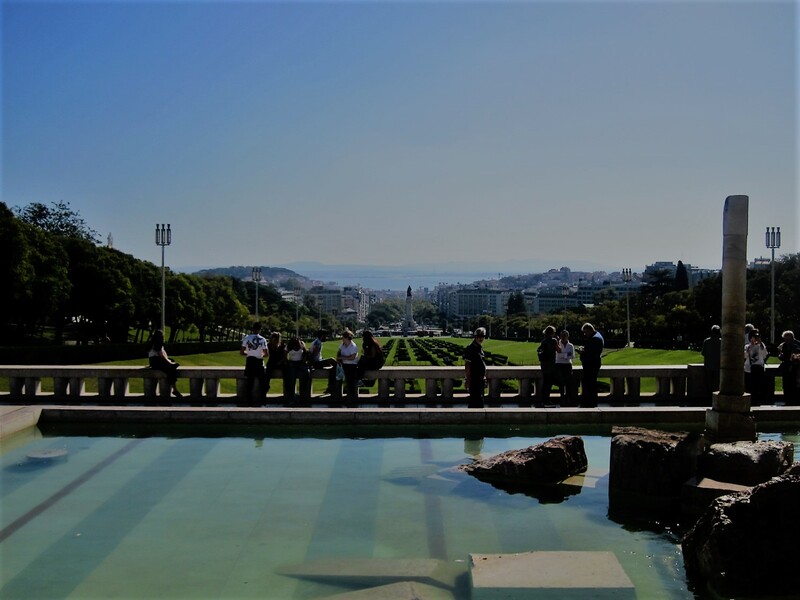 The Monument to the Discoveries, as we see it today, was formally opened in 1960 to commemorate the voyages of exploration which departed from here as far back as the 15th century. Trade was established with countries as far away as India. You know what comes next, don’t you? There was almost no queue for the lift that takes you most of the way up. Did you spot Michael, in the blue t’shirt, sitting patiently waiting below? He thinks it’s pastel de nata time. Just another couple of shots! Patience should be rewarded, I’m sure you’ll agree. What a place! I was astounded. 400 seats and choc full of character. But best of all…. I don’t suppose many of you will feel like a walk on Christmas morning, so may I take this opportunity to wish all my walking friends a peaceful and happy Christmas. I have enjoyed your company so much and I hope you’ll continue to walk with me in the New Year. Not many walks to share this week. Everyone’s busy, but spare a minute or two to say hello? As always, many thanks to readers and walkers alike. Details of how to join in are on the Jo’s Monday walk page. Let’s start with Tammy’s interesting tour in my part of the world. Watch out for the Fisherman! Jackie with a bit of seasonal spice this week? That’s it for now. Hope you enjoyed it. Remember to breathe- it comes around every year. Merry Christmas! Campolide is not an area of Lisbon that sees many tourists. On a mission to find Aqueduto das Águas Livres, as usual I walked, disregarding the guide book advice to catch a bus. It didn’t look far on the map. The locals I asked assured me it wasn’t far. 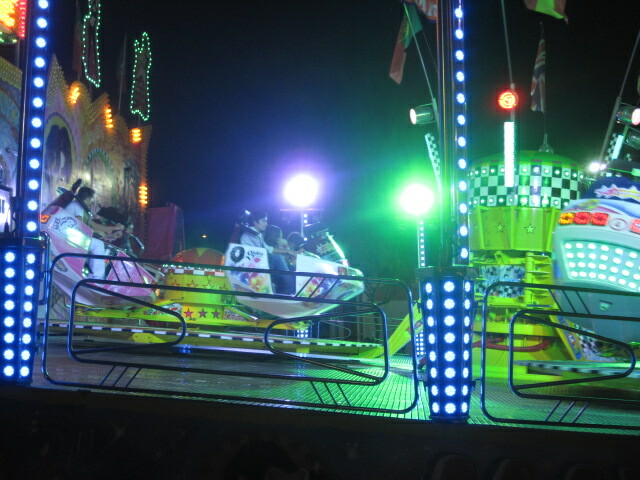 But finding it involved a lot of interesting uphill and roundabout, as you can see from the gallery. 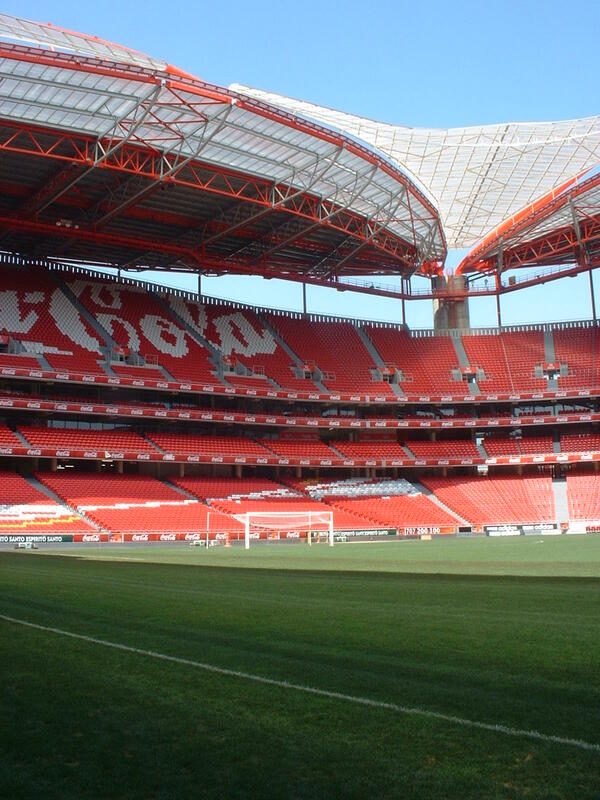 I already had some idea of what I was looking for because we’d passed beneath it on the coach into Lisbon. Finally, perseverance paid off. 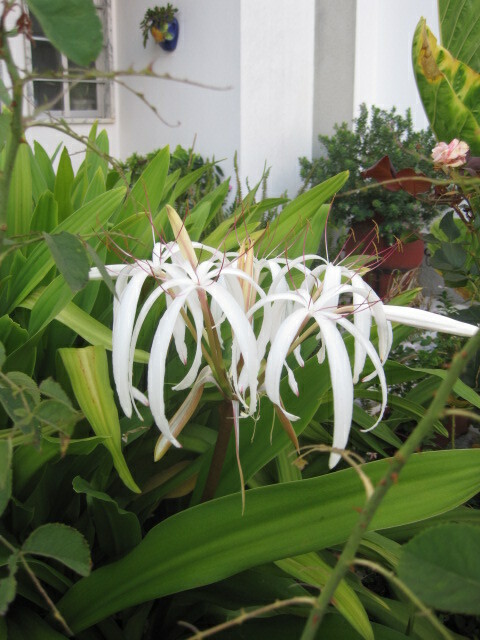 But the garden scarcely revealed a clue of what I was about to experience. Aqueduto das Águas Livres was a monumental undertaking, designed in the 18th century to bring water to the parched city of Lisbon. 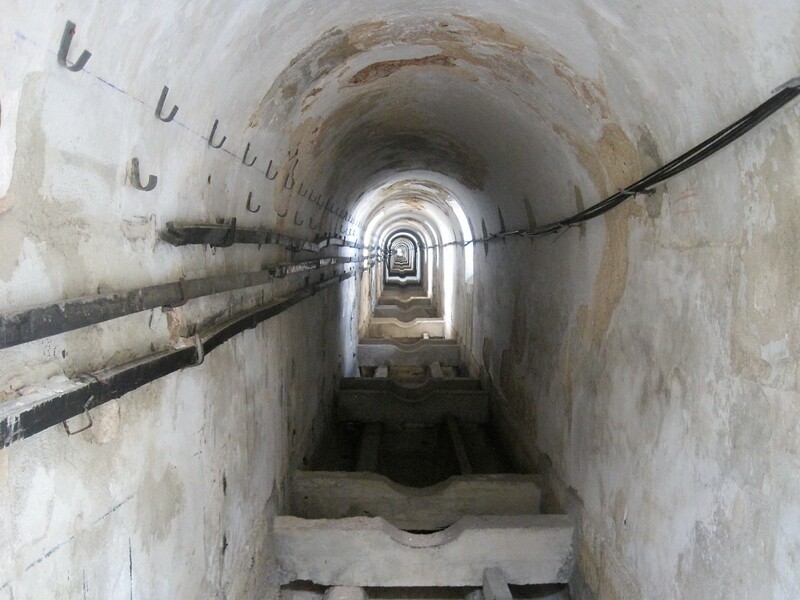 The main course of the aqueduct covers 18km, but the whole canal network extends almost 58km. 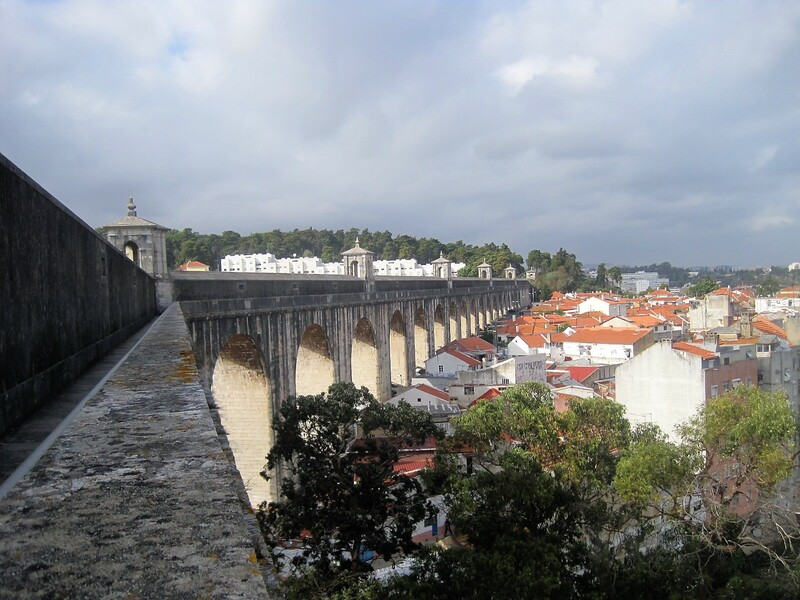 Construction began in 1731, the centrepiece a total of 35 arches spanning the Alcantara valley, conceived by Custodio Vieira, the tallest being 65metres high. Opened in 1748, while still incomplete, amazingly it withstood the devastating earthquake of 1755. Fascinating, don’t you think? I thought I’d already used the title Scaling the Heights before, and so it proved, when I managed to Ascend to considerable heights, early this year in lovely Florence. I do enjoy a good view. As I was meandering around the cobbled streets of Tavira, I spotted, several times, a leaflet in a shop window. Always interested in a new venture, I went to find out more. ” Fado com História” is situated in the heart of the old quarter, just beside the Misericordia Church and below the castle walls. What I found delighted me. If you’ve never experienced Fado, or think that it might not be for you, I can recommend you to this introduction. Fado originated in Lisbon, and the show begins with a video featuring some of Portugal’s most famous Fado singers, so that you get a feel for the sound. Most prominent among these was Amalia Rodrigues(1920-1999). She said that “Fado has to be felt. Fado isn’t sung, but just happens. You feel it, you don’t understand it, nor can it be explained.” Such passion did she arouse that, when she died, Portugal held 3 days of national mourning. 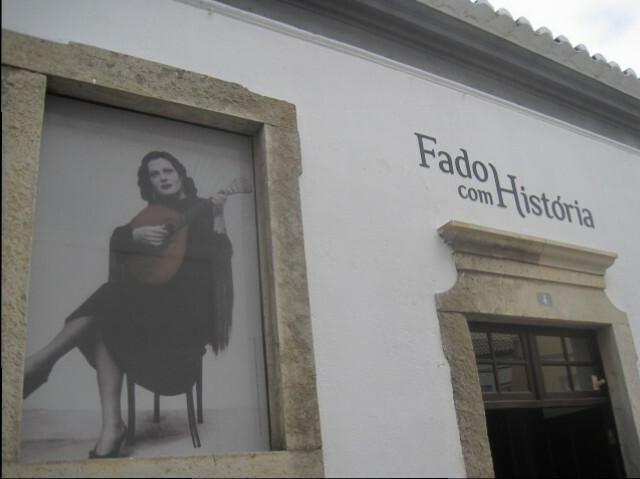 Nowadays Fado can be heard throughout Portugal, usually in an atmospheric bar or restaurant. 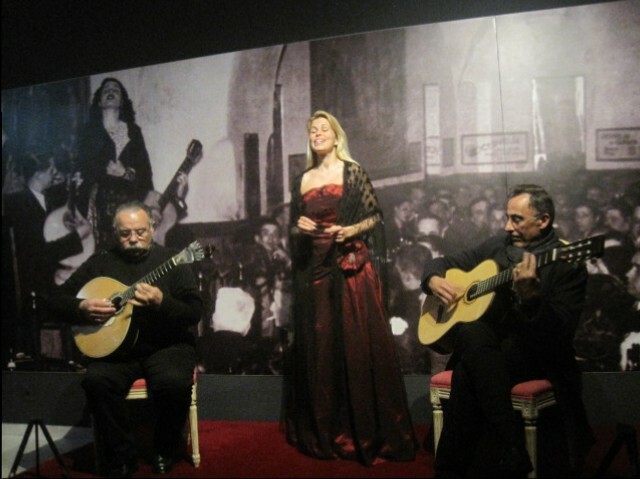 “Fado com História” is a small venue, featuring a trio of live artists. 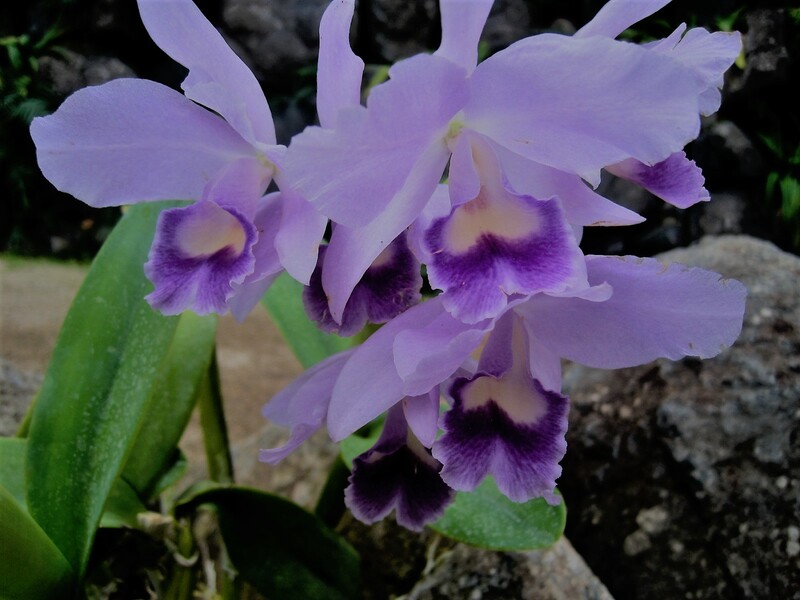 They include Virgilio Lanca, who plays guitar and makes most of the explanations in a soft voice. He describes fado as “a song that gives you goosebumps”. Miguel Drago plays Portuguese guitar, which has 12 metallic strings in groups of 2. You could hear a pin drop as the two begin a guitarrada, demonstrating the ebb and flow of their art. They are joined by a fadista, Teresa Viola, a lovely young woman with a beautiful voice. She closes her eyes, takes a deep breath, and leans into the performance. Accompanied by the guitarists she sings 4 or 5 fados, explaining the stories behind them. The backdrop is a wall-sized photograph of a 1942 performance at Cafe Luso, in Lisbon, featuring the great Amalia. The passion of the performers for their project is clearly evident, and at the end of the show they are happy to talk about it. They are working in conjunction with the Fado Museum in Lisbon but have found a different way to present fado, and the live performances are key. The museum is open from 10am to 5pm every day except Sundays, and a new show begins each hour. Details are at http://www.fadocomhistoria.wix.com/fado . I can only suggest that if you have the opportunity at any time you should go along. You will be warmly welcomed. This video is in Portuguese but is quite easy to follow. Jakesprinter’s subject for this week’s Sunday Post is Goals. Not my favourite topic, but let’s play with it! 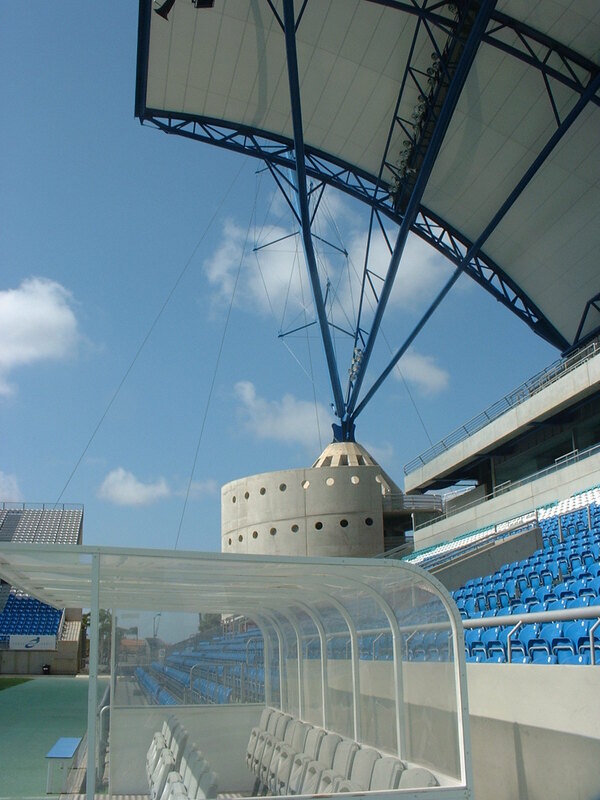 Both my husband and son are huge football fans, and can’t wait to check out the local stadium whenever we travel. Which leaves me free to look at more interesting things. And I do! But most likely, I’ll linger by that bridge again! I don’t really have my goals for 2013 clearly defined yet. 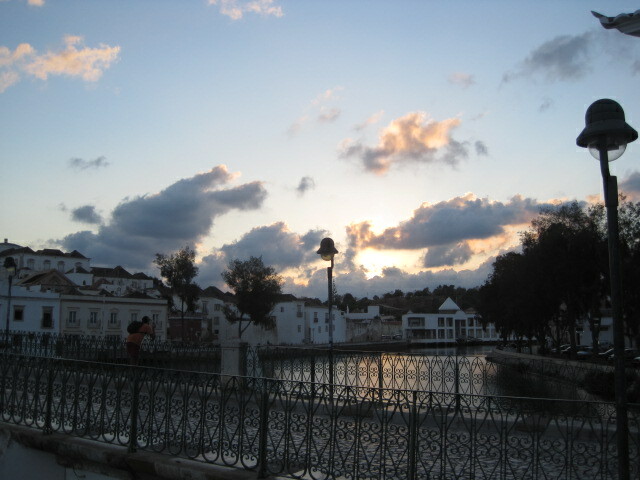 I surely plan to spend more time in Tavira, and to do some travelling around Portugal. I usually try to tie that in to a festival or event. Jerez and Cadiz have been beckoning me for a while, and I’m mildly curious about Gibraltar. I absolutely must do something about my wilting language skills, particularly because I hope to visit Polish family again this Spring. A new self-hosted website, a photo book? Those decisions still haven’t been taken. Live my life as fully as I can, without hurting those around me. I guess that has to be my main goal. And if I could do a little good along the way, that would be magnificent. I’ll let you know how I do. I’m sure there are some cracking goals on Jake’s page, so let’s hit the flying dragon logo link and go check him out, shall we? It’s always a pleasure.